If you were arrested for drunk driving in New Jersey, it is likely that you submitted to a breath test. Although the results of the breath test might have shown that you were over the legal limit, do not assume that these results are valid. The machine is not perfect and police officers have been known to make mistakes. An experienced DWI defense lawyer can potentially challenge the breath test reading in your case. The Tormey Law Firm defends clients against charges of impaired driving in Newark, Roseland, and everywhere else in Essex County. In fact, we have had great success getting breath test readings thrown out in court because our founding partner, Travis J. Tormey, is a certified DWI Alcotest operator. This means that we have unique insight into how this device works. Additionally, our DWI defense team includes a former DWI prosecutor and an ex-NJ State Trooper who is certified in field sobriety testing. Call the Tormey Law Firm today at 201-654-3464 so that a member of our team can examine the breath test results in your Driving While Intoxicated case. You can also view examples of our Successful DWI Verdicts. 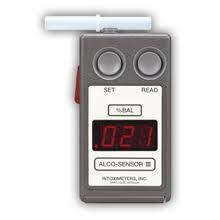 The legal limit for adults in the State of New Jersey is .08 percent blood alcohol concentration (BAC). Anyone found driving with a BAC of .08 percent or higher is subject to severe DWI penalties, including jail time and driver’s license suspension. Portable Breath Test (PBT): This device is carried in police patrol cars and is administered during roadside stops. You have a legal right to decline to take the PBT because it is considered highly unreliable. Alcotest 7110: This device, sometimes called a “Breathalyzer,” is administered by trained personnel at the police station. Although you may decline to take a PBT, you are required to consent to an Alcotest. If you decline to take the breath test, you can be charged with both DWI and Refusal to Submit to a Breath Test. That’s why it is almost always in your best interests to take the breath test when you are stopped for suspicion of impaired driving. Travis J. Tormey knows what it takes to get your breath test results ruled inadmissible as evidence in court. Mr. Tormey is certified in the operation of the Alcotest 7110 and trained in the use of the Alcotest 7110 MKIII-C Version NJ3.11. He understands the device’s analytical system, components, and peripherals. He also knows how to operate the device and perform a breath test sequence. Mr. Tormey will examine the evidence and inspect the device used to perform your breath test. If any mistakes were made in calibrating the machine before the test or administering the test after your arrest, Mr. Tormey will file the necessary motions in court. The Tormey Law Firm also utilizes the services of a retired New Jersey State Trooper who is certified in both Alcotest operation and field sobriety testing. When you hire our firm, we will put our DWI expert to work for you. In many cases, he renders an expert report to challenge the prosecution’s evidence. He is also able to testify at trial as a defense expert if needed. If you or a loved one has been accused of drunk driving in New Jersey, do not be intimidated by the evidence against you. Let the experienced DWI defense attorneys at the Tormey Law Firm look over your breath test results and determine the best course of action in your case. Call us at 201-654-3464 to discuss your charges, or email us to schedule a free consultation at our Newark office.